Science fiction is supposed to challenge and stimulate our thoughts about life. This is usually accomplished through escapism and “what if” situations. But what is curious is how it does it. You see, I have this theory that one of the best ways to share new ideas is through science fiction, because the medium inherently combines the creative with the analytical. And it cuts through all of the ego, to get to the root of humanity… and what makes us special. Jeff Nichols is an American film director known for making independant films with minimal budget. He has now directed four films total (Shotgun Stories, Take Shelter, Mud, and Midnight Special) and is currently working on a fifth movie about prejudice against interracial marriage in the 1970s. That movie is called Loving. All of these films are dramas, though Midnight Special is without a doubt the most interesting film he has made to date. And it should be noted Nichols has cast Michael Shannon as his lead three times now, with Matthew McConaughey as an alternate and correctly chosen for 2012’s Mud. Which came out just a year before McConaughey got his Best Actor award at the Oscars for Dallas Buyers Club. So keep that in mind. Set in the the southern United States, I believe somewhere in Texas, Roy (Michael Shannon) and his friend Lucas (Joel Edgerton) have seemingly kidnapped a young boy named Alton (Jaeden Lieberher) – who we later find out is Roy’s son. Roy and Lucas are on a mission to return Alton to his mother Sarah (Kirsten Dunst) and eventually get Alton to an undisclosed location by a certain date. The movie reveals information to us in pieces. With each piece of information letting us in on the story a bit more. It turns out that Alton and his parents were part of a religious cult, and because Alton possesses latent supernatural abilities, which are also slowly revealed to us, the FBI has become involved and sent Paul Sevier (Adam Driver) to investigate cult. To reveal more of the plot would be a huge disservice to the story, but before I move on, I will mention this, this film is grounded the grittiness of dramas of the 1970s, very slowly giving ways to fantastic wonderment of early 1980s science fiction. And it is amazing to behold. Pros: The story manages to avoid direct violence and rely on the imagination where necessary, but also use CGI in a way that the story becomes better, rather than extraneous. The relationships between family, friends, and believers are beautifully depicted. Cons: At times the pacing felt too rushed, while other times it was oddly slow. And so the movie often feels strange, and the tension never raises to a point where leads are in imminent danger. Points of Interest: Jeff Nichols wrote the film as an allusion to becoming a father himself, and it was shot over a period of 40 days. 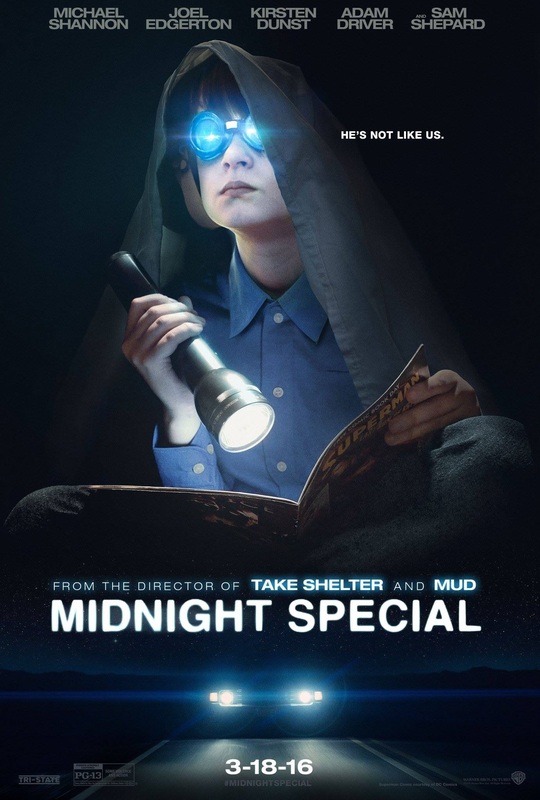 Midnight Special is, to use a single word, special. It is an excellent example of GOOD modern storytelling in that it relies on both practical filmmaking camera work and CGI to tell its narrative. It’s cast is well chosen and the implications of the final reveal make it worthwhile on any science fiction fan shelf, but it holds a special place in the current political environment as well. I still don’t really know why the movie is called Midnight Special, I think it has something to do with the song, but maybe that doesn’t matter. What matters is that the movie is accessible and addresses issues that we can all relate to. And so it qualifies as good science fiction. But what do you think? See you tomorrow with some wisdom, dear readers.